All the Primary Schools shall conduct SA-III examination from 9.30 a.m. to 12.15pm by following morning school timings i.e., 8.00 a.m. to 12.30 p.m.
 High Schools shall conduct SA-III in the afternoon from 2.00 p.m. to 4.45 p.m. All the staff and students attend the school at 12.30 p.m. The Mid-Day-Meal should be served and examination will be commenced from 2.00 p.m. So there is no need for the teachers to attend in the morning session.  All the UP schools shall conduct SA-III examination for classes I-V 9.30 a.m. to 12.15pm and classes VI – VIII from 2.00 p.m. to 4.45 p.m. 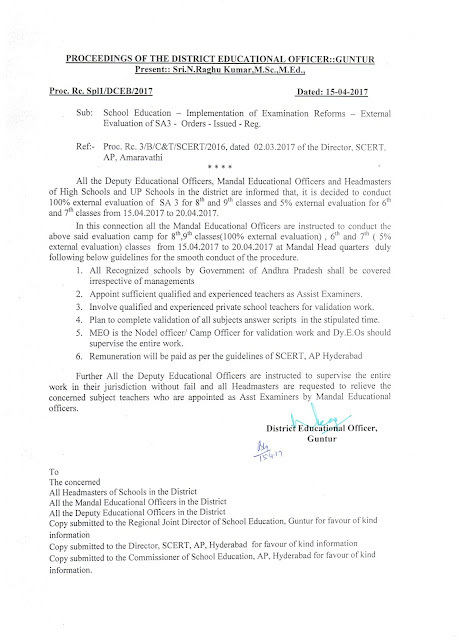 The Headmaster has to decide which teacher has to conduct examination classes I –V and classes VI – VIII. Those who are conducting examinations from 2.00 p.m. to 4.45 p.m. are need not to attend morning session.